I took my friend Brad to his first Yes concert - I first saw them in Madison, WI in the 70s. This conecrt was perfection! A bit of a sound problem the first1-2 songs but once that was ironed out it was one great song after another. They played so many classic Yes tunes. My friend was blown away. It was one of the best concerts I have ever attended. 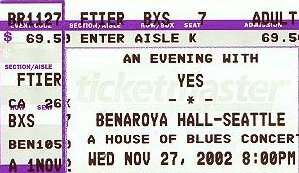 This was the first yes concert I've ever attended. Wow. What a great place to see my first concert. At intermission I went to buy a drink and a lady came up and asked if I would buy her a drink, because she only had a dollar. After giving her a bad time, and buying her a drink she says "since you bought me a drink follow me". Me and my friend followed her to the second row and watched the rest of the concert. Wow, even better. We were also fortunate to have back stage passes. WOW could it get any better. I would like to thank my Dad for giving me and my friend Peter the tickets and Alan and gg for being great people and can't forget the lady with 1 dollar, it was a blast.